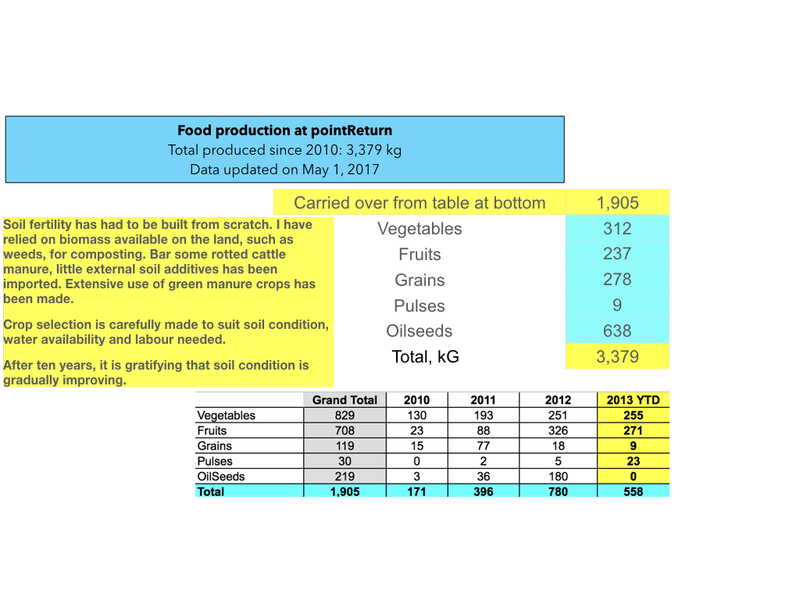 Following table is a running score of food produced at pointReturn. 1- No crop had ever been grown with any commitment on these lands. There are vague references by shepherds to casually broadcast millets. The land had been a trespassed access between the villages of Peruveli and Annanagar, and was openly grazed. Annual runoff had created a hard pan and it was further compacted in parts by way of vehicle treads. No water had any chance of residence to support food growing. It is such a land we began with. 2- Between 2007 and 09, working mostly alone I focused on developing access, water security, fences and basic facilities. I had earmarked about 0.1 acres, in two parcels, for grain growing and made one attempt at it in 2008, with a modest result. 4- So the figures you see above for 2010 and 11 are from a total of 0.15acres, on poor soil, slowly being made fertile, with limited quantity of water and hardly any hired hands. 5- In 2011 a well was dug and about 0.20 acres are being developed for grain crops. In 2012 assured irrigation from the well will likely accelerate food growing.